S.C.H.O.O.L. grew out of a mission trip to Haiti when God answered the following question for Kathi Caton "What is God's purpose for me?" 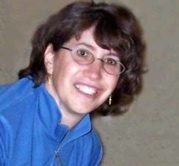 He set the beautiful Haitian children in front of her touching her heart forever and thus "Schooling Christian Haitians Out of Love" was born on a mission trip in March, 2007. 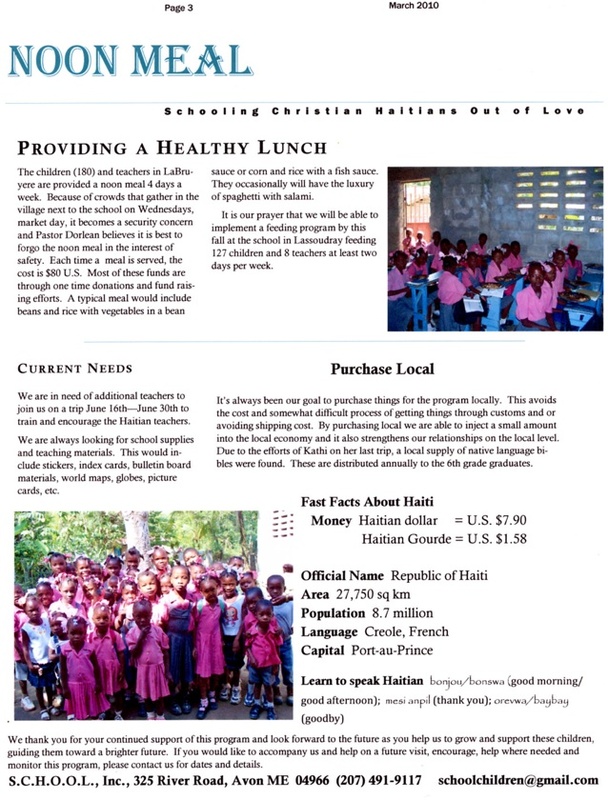 Since that day Kathi has worked tirelessly to give hope and love to the Haitian children and with your help the children can be provided with food and an education. Pastor Dorlean and Pastor Dagonzaque from LaBruyere and LaSoudre, have been praying that someone would come along and help the children of their communities. There are over 150 children that need sponsors in order to attend school. 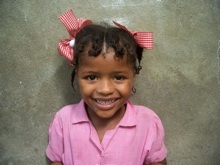 You can be a part of meeting the needs of these children through your love, prayers, and financial support. 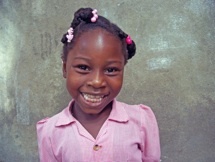 For as little as $20 per month, you can reach out and help a child receive an education. Contributions are also being accepted to start a Feeding Program in these two schools - LaBruyere and LaSoudre. S.C.H.O.O.L. 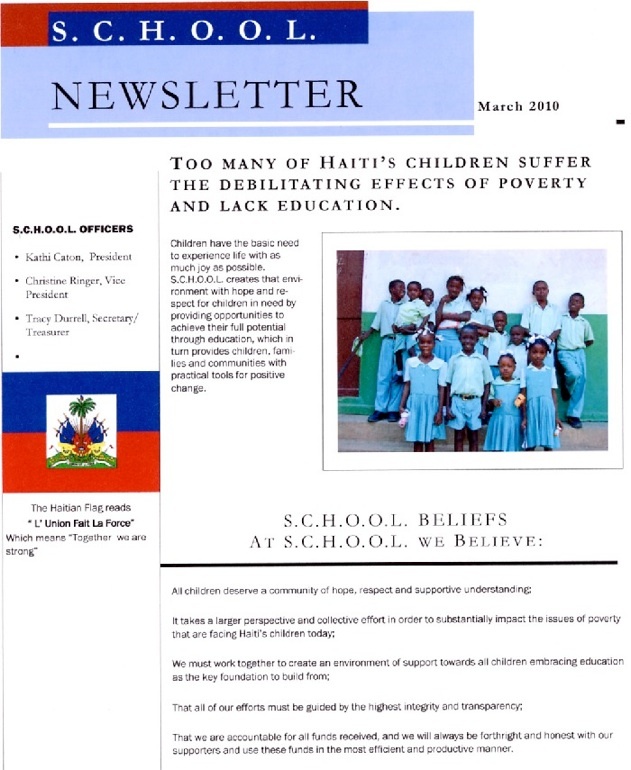 is an all-volunteer organization - all of your contributions go directly to the education and feeding of children in Haiti. Also, a one-time contribution toward the sponsorship fund will help cover a child whose sponsor, for unforeseen reasons, can no longer continue sponsorship. 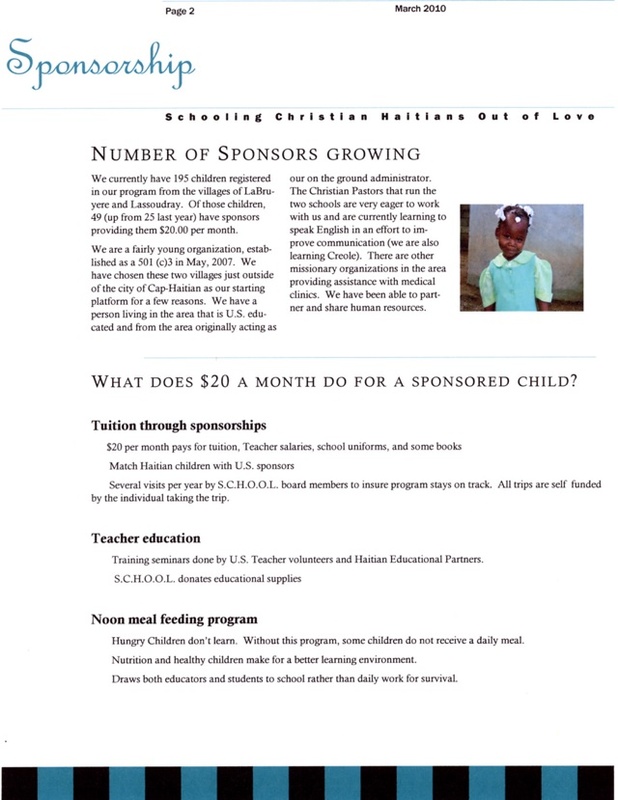 It will help keep a child sponsored while a new sponsor is found. When a school group sponsors a child, it may cover the summer months.